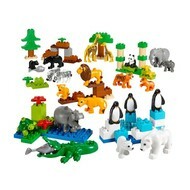 Meet the exciting creatures of the Wild Animals Set. Preschoolers can explore many different themes from what the animals they eat to what they need to survive and prosper in their habitats. The set provides an imaginative way to talk about relationships between mothers and baby animals, and the needs of living creatures. The set provides hours of creativity and free play for a group of children. Set includes 24 LEGO® DUPLO® animal figures, habitats that include the forest, jungle, arctic, sea and river. This set offers an imaginative way to teach about animal care and relationships, and allows children to take a look at what animals need to live and thrive.